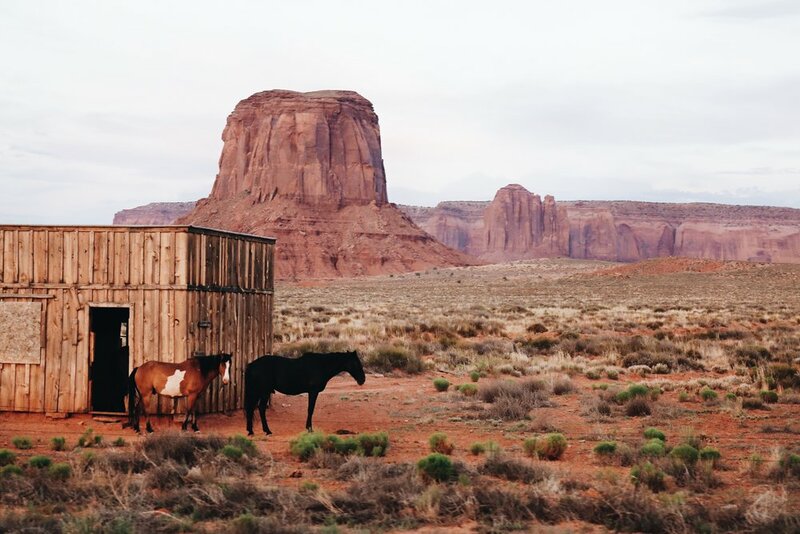 The American Southwest is a region full of spectacular landscapes, but they don’t get more iconic than Monument Valley. Around 60 miles west of the Utah-New Mexico border, welcome to the valley of the rocks, Tsé Biiʼ Ndzisgaii. We headed North through Black Canyon City, climbing the steep, winding roads bordered by cactus trees, plateaus and rocky peaks. For the first time on our US adventure, it felt as though the country we were exploring was beginning to show us its true scale. The roads were fast, the horizon expanding; scattered micro storms danced around us as we drew ever closer to Sedona. As we entered the quaint little town, towering walls of red rock greeted us, an awe-inspiring sight unlike anything we had experienced before. Recognised by Native Americans as a place of healing and spiritual energy, the surrounding peaks were a stunning glimpse at what was in store for our adventures in this breathtaking part of the Southwest. We stopped briefly at Garlands Navajo Trading Post to admire some of the beautiful handcrafted turquoise jewellery and Navajo artwork before pressing forward through Slide Rock State Park. We hit highway 89 passing Grey Mountain and on towards Tuba City. The world began to look like a very different place, the road seemed like a lifeline; the only thing resembling normality. Abandoned trading posts replaced the countless fast food signs of the south and tiny communes, battered shacks and dusty cars were the only signs of life for miles. Every now and then we would pass a hitchhiker, exposed and alone in the elements. We battled with rainstorms, mist and high winds, taking the 160 northeast towards our final destination, weary but determined to make it there by sundown. As the sun begun to descend, the horizon cleared and washed the sky with bright pink and blue hues, our spirits instantly lifted. We don’t really know what we expected, but our first sighting of Monument Valley was a feeling we will never forget. We gazed out into the horizon, stunned and humbled by the astonishing red sandstone monuments ahead, breathtakingly beautiful and instantly recognisable as the iconic backdrop to all those John Ford westerns. Even the photographs could never truly capture the awe we felt. Inside the park, there is only one place to stay: The View Hotel. Appropriately named, as the views looking over the valley from each and every room are nothing short of spectacular — make sure you book months in advance. Sunrise here is unmissable and unforgettable; the morning rays shower the buttes and mittens with golden hues as the earth awakes. On the balconies of The View, hundreds of camera shutters sound in unison, a magical moment shared by all who witness the valley’s impressive display.